*If you don't have almond extract on hand, you may substitute it with vanilla extract. Preheat oven to 350 degrees F (180 C). 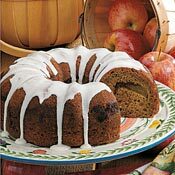 Spray a 10-inch bundt or tube pan with nonstick cooking spray. Set aside. Set aside 1 tablespoon cake mix. Set aside 1 1/2 cups pie filling. In a mixing bowl, combine eggs, sour cream, water, oil, extract and remaining cake mix and pie filling. Beat on medium speed for 2 minutes. Pour half into the prepared 10-inch bundt or tube pan. Bake at 350 degrees F (180 C) for 40-45 minutes or until a toothpick inserted near the center comes out clean. Cool for 10 minutes before removing from pan to a wire rack. When cake has cooled, drizzle with glaze, or if desired dust cake with confectioners' sugar. In a small bowl, combine glaze ingredients. Mix well. Drizzle over cooled cake. Served at a ladies meeting and was enjoyed by all. Already passed recipe along to another. Excellent, very moist. Family loved it! nice rich cake but needs more decoration. Great recipe! Very moist and delicious.